It’s almost the end of March….did Mother Nature not get the memo? Not that we are mad, we love that white stuff. We are so close I can taste it, and by it I mean the big breakfast T is making tomorrow. He says we need to be pumped and ready for bathroom progress, I am just hoping I get to eat it whilst under blankets. At like noon. Doubtful. 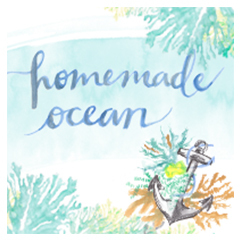 My version of getting “pumped” is perusing Etsy shops….ever so often I will happen upon a shop and think how can one person make so much beauty. That’s exactly what I thought when I stumbled upon Mary Kate McDevitt’s shop full of handlettering and illustrations. What’s up gorgeous and quirky screen prints, you had me at hello. I just got to have that “Ladylike Whiskey” print. If you’re a coffee fan, you absolutely need to check out her shop. She has the best prints you will find, makes me want to start drinking coffee. Maybe tomorrow. Or once I get my new mug. 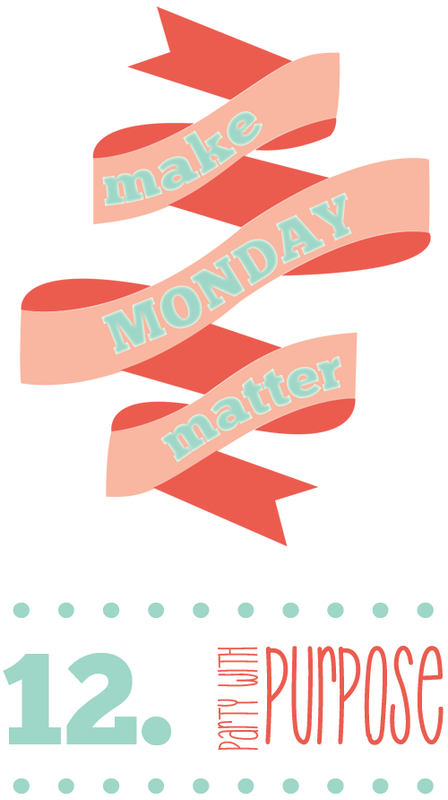 It seems that everyone in my blogosphere was crafting this week, oodles of inspiration. 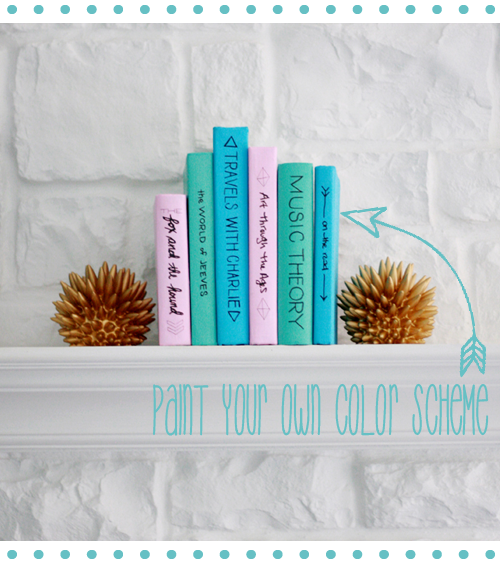 I want to do all three of these. I have been wanting to cover some of my not-so-pretty-books-that-i-love-to-read in a pretty paper but I had never thought of painting them. Laura from The Band Wife is a creative soul and always has the best ideas. Seriously, check out her Valentine’s decorations, not to mention her reality-show-worthy life. Consider my pants blown off (read the post, you’ll catch my drift). 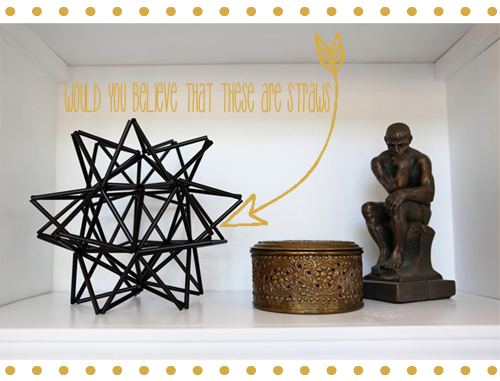 Can you believe that Katie Bower from Bower Power Blog made that pollen ball out of straws and string…no seriously she did. Plus, she did it in under an hour and for a couple bucks. Yes…I will have a pollen ball by Monday. Okay, so we’ve all pinned the photo of the hanger with the hot glue swigglies. How much better does this look? You can’t even tell that the hangers have been altered. Miranda from One Little Minute is the most amazing sewer out there, but she outdoes herself when she comes up with stuff like this. What did you find impressive this week? Got any plans for the weekend? St. Louis is hosting a Baconfest and Comic Con….but you know where we will be. 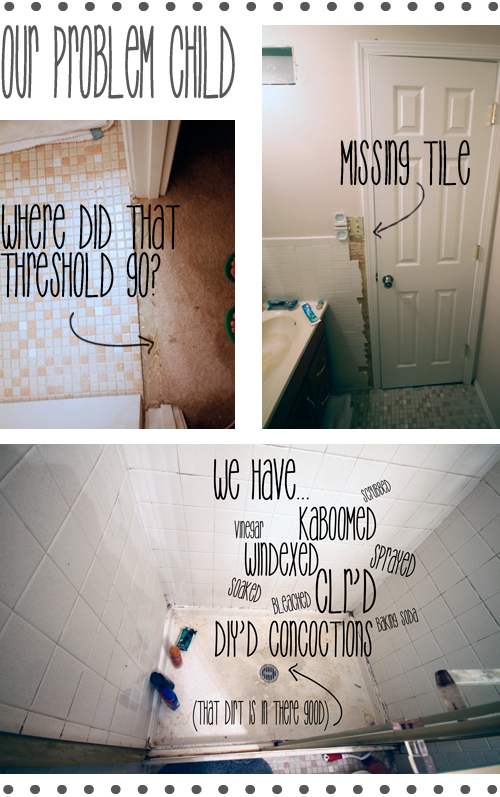 You already know that we tore apart our bathroom after a casual trip to Lowes. And that we are struggling with finishing decisions….to trend or not to trend. 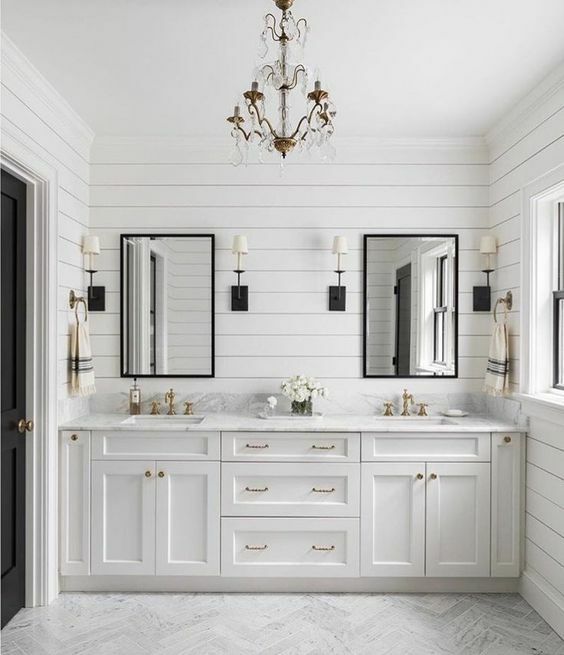 Today, I want to share a whole lot of inspiration with you….just in case you are having second thoughts about that bathroom of yours. Can we first talk about the “inspiration” you can find on the internet though. Please raise your hand if you have a bathroom the size of my basement because according to the interweb this is totally normal. You should have two showers, and a ten foot vanity, and a sofa…and can I get a hot tub. Somehow we got jipped with just one sink, and no room for a Lazyboy. Lame. 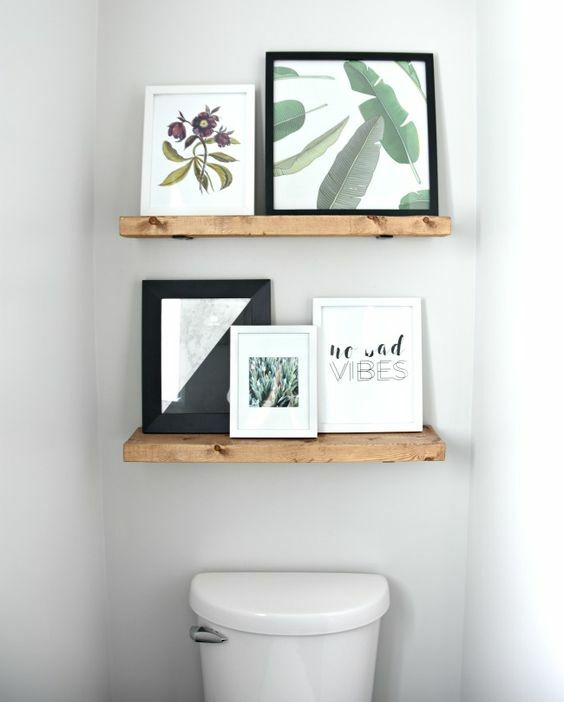 I think a lot of these inspiration photos can be scaled down, and elements can be used in smaller spaces. If we are being honest, I am dreaming that the lottery ticket I bought yesterday is a winner so that I can hand the photos below to a builder and say, “I’ll take one of each”. I love so much about this first bathroom. 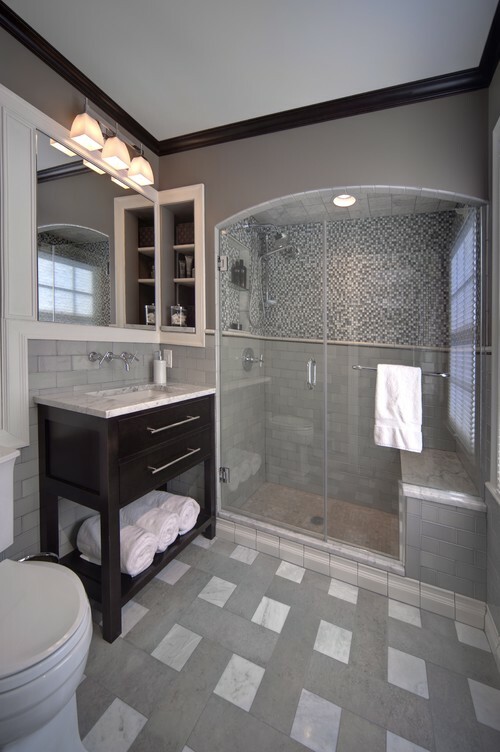 From the arches creating a “built-in” shower to the mirror that wraps into recessed shelving. That vanity is right up our alley as well. 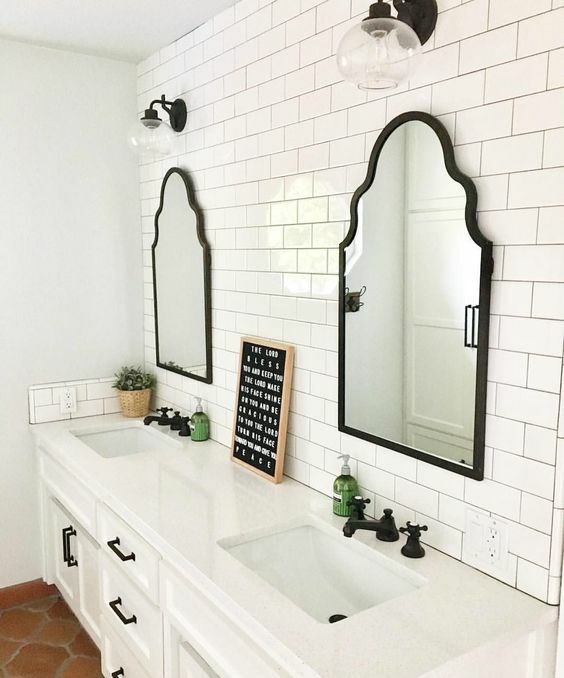 Did you notice the sink faucet is on the wall, now that is fancy. Eclectic Bathroom by Columbus Design-build J.S. Brown & Co.
Tim and I are throwing the “horizontal built-in shower shelf” around a lot these days. We pin them and email them and dream of gorgeous accent tiles in the back of them. 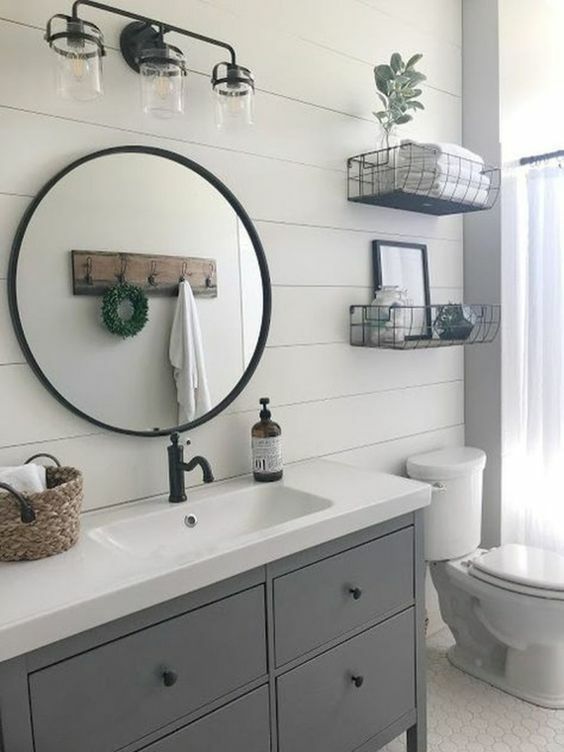 I love the oversized shower head and T is feeling the “hidden” storage above the toilet. Am I the only one that hasn’t seen a towel bar on the side of a vanity? I think it is genius, Tim says that’s old news. Either way how fun are the insides of that vanity? Put that on the to-do list. 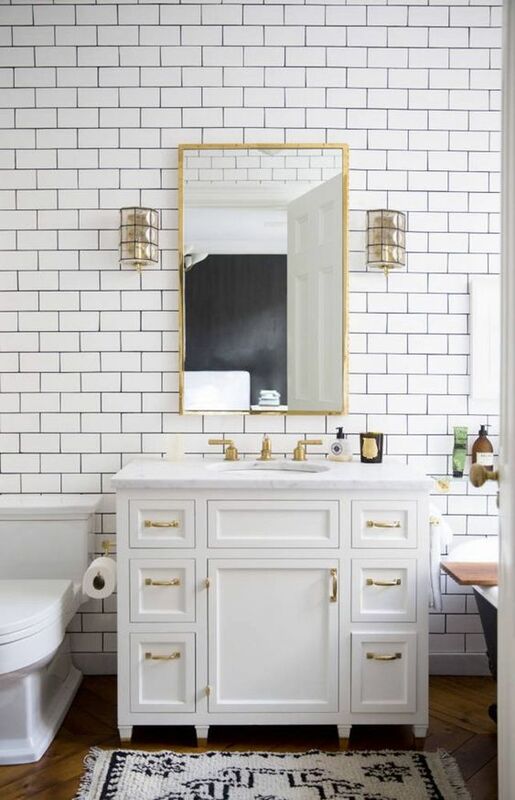 This next bathroom is not really the look we are going for, and I generally am not a fan of mosaic tile but can you imagine showering in a pearl. Seriously, that’s what it would be like…a shimmery oyster shower without the fish smell. 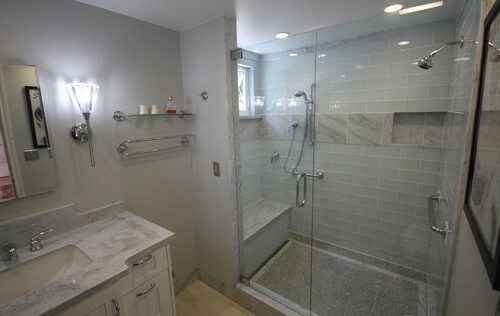 We really love the frameless shower doors, keeping our fingers crossed that they are in the budget. Still in love with herringbone….enough said. 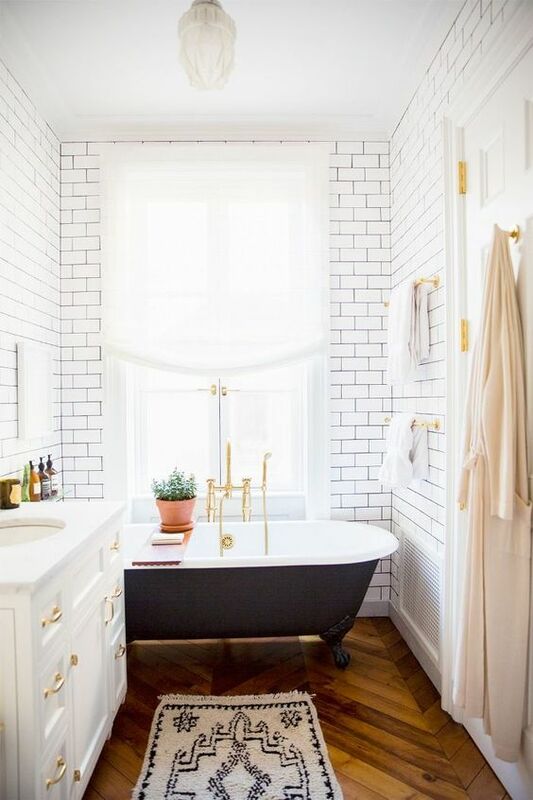 We love all the different tile going on in this bathroom, and how cohesively they mix. This makes me want a window so badly, I long to hear the bird chirping while I condition my hair. Maybe one day. 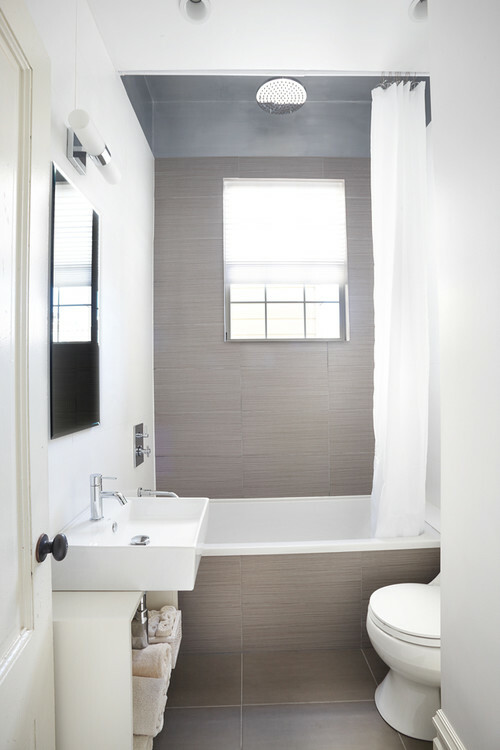 Contemporary Bathroom by San Francisco Design-build Nerland Building & Restoration, Inc.
Another image that solidifies my love for subway tile. Swoonity swoon swoon. I don’t think I can talk Tim into this but I’m obsessed with those hanging light fixtures. 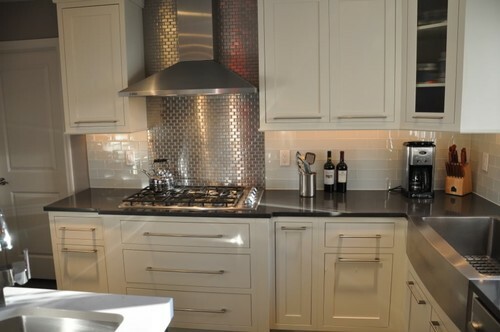 We looked at tile similar to this but worried that with no natural light the room would feel dark and gloomy. We are suckers for contrast. I know this isn’t technically a bathroom….but I wanted to give you a peek at the kindle that started our “glass tile and stainless” fire. 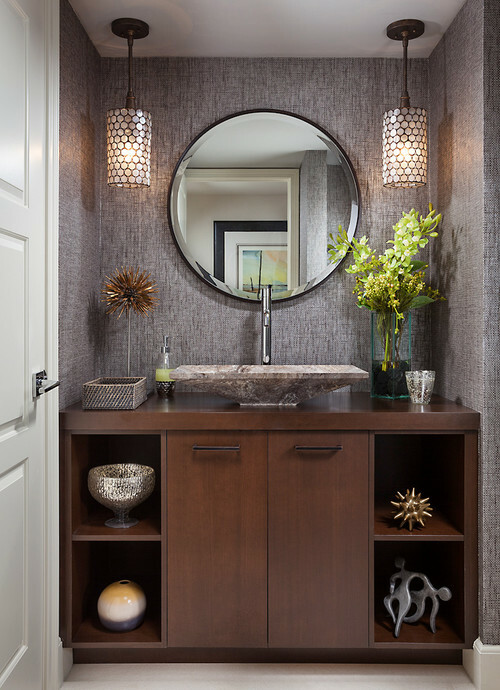 For more of our bathroom inspiration, check out our Houzz ideabooks. 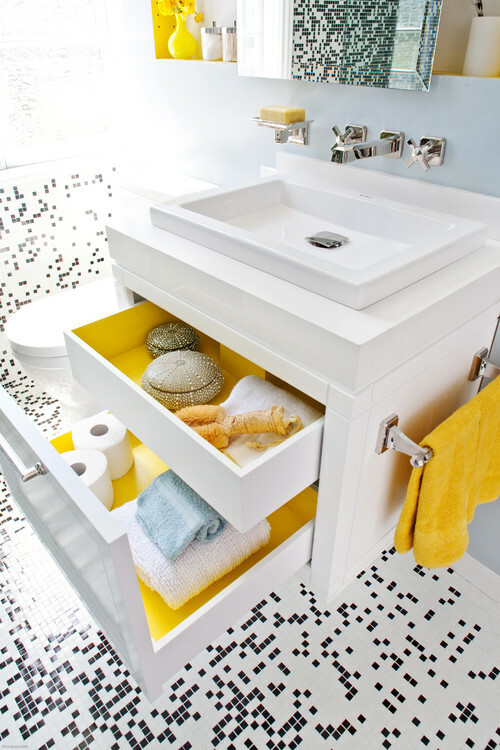 Have you stumbled on any great bathroom ideas? I got some great ideas from our Facebook fans (thanks guys)! I told you that when we went to look for flooring we magically picked out tile for the master bathroom. We even brought the samples home, and displayed them proudly for all to see. All meaning us…and the dogs. Then something happened, I freaked out. I started thinking about staring at that tile for the next ten years, and wondering how hideous the next home owners would think it was. Will my faux wood floor be the equivalent of gold shower doors? Will this “linen look” actually just come off as dirty? Originally we picked out “Leonia Silver” for the walls and “Sersa Black Walnut” for the floors. We had left any accent tiles up in the air….and that’s when the panic set in. We still really like both, but we just don’t think they are quite right for our space. I started browsing. Pinning like a maniac, and rekindling my romance with Houzz. Tim and I both agree that this room should be masculine and modern. What we can’t agree on are the finishes. We both like a couple different things that always end up contradicting. 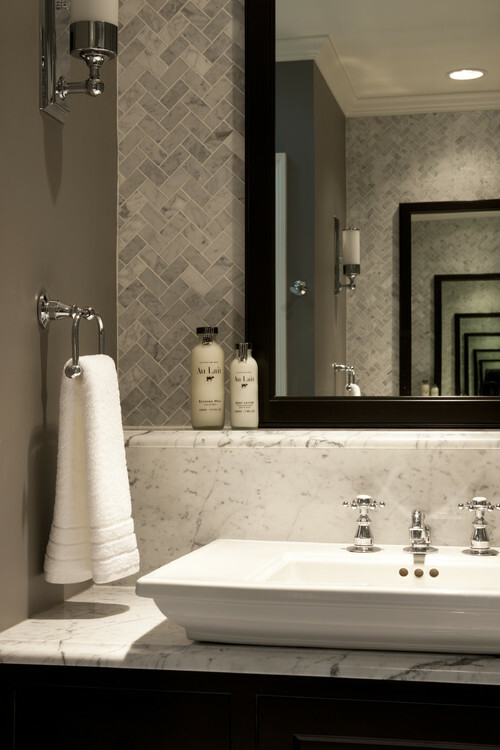 For instance, we both love the faux wood tile from our original dream team…but hate the look of it with a wood vanity. Enter gray floating vanity stage right. If only there were an Ikea closer. Hola Option One. 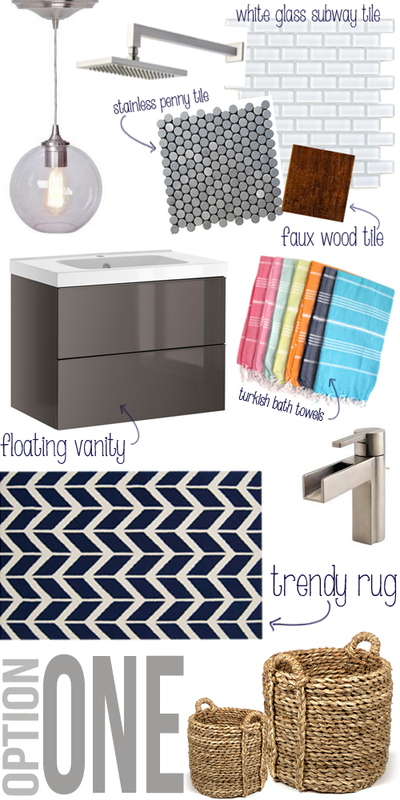 I have a serious crush on the Turkish Bath Towels, and a new bathroom is a totally legitimate excuse to buy some. Almost everything pictured would come from Lowes, with the exception of that vanity from Ikea. 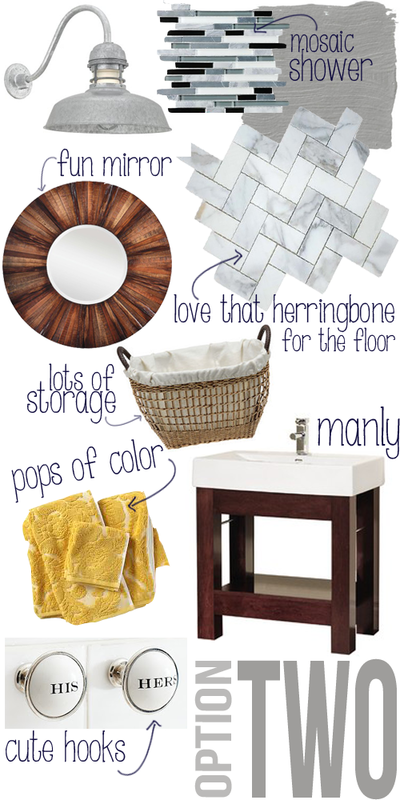 But then again… On the other hand we also both like the herringbone trend, but aren’t crazy about it on the walls. 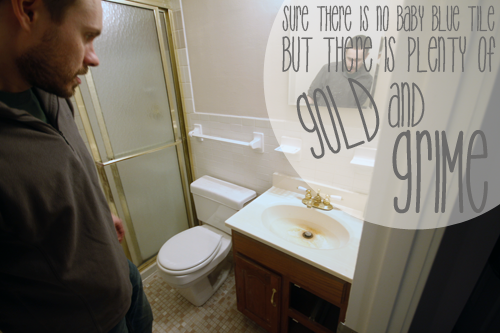 Which leaves us with floors, which means we could have a wood vanity….but that means no wood floor clearly. And then we are left with what to do on the walls. Tim likes a manly mosaic, but I still can’t quite commit. 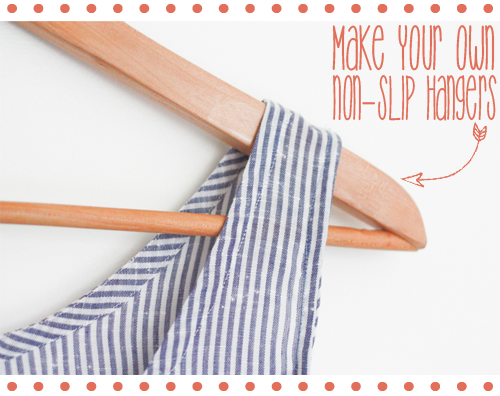 Are you down with the herringbone? Think I can convince Tim to let me bring some more color in? What is your favorite? The other day T and I decided to take a little stroll though the flooring aisle at our local hardware store…you know…for fun. We have big dreams of replacing all of our flooring with gorgeous hardwood floors, you know when we hit the lottery. Since we bought a lotto ticket that day we figured we might as well start planning. Somehow we wound up in the tile aisle, more dreaming. Only this time, we did more than dream. 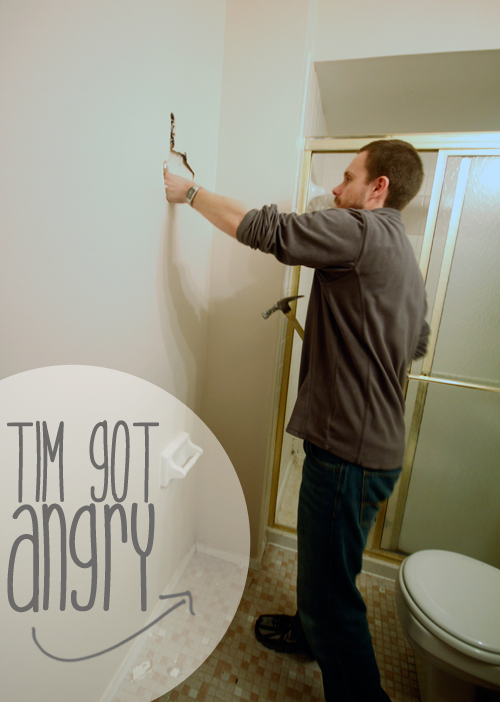 For two years all Tim has talked about is updating the bedroom bathroom. For two years I have pushed project after project in front of that bathroom because it was so overwhelmingly grimey in there that I was just more comfortable closing the door and whispering about our “problem child” behind its back. Well, bedroom bathroom…your time has come. I know it isn’t covered in Pepto pink tile and shag carpet, but it is definitely outdated and ready for some upgrades. Not to mention, the dirt. We have tried so hard to scrub that shower tile clean to no avail, scrubbed so hard that we decided it’s easier to just replace it. Can we talk about towel bars for a moment. They are everywhere in this house. 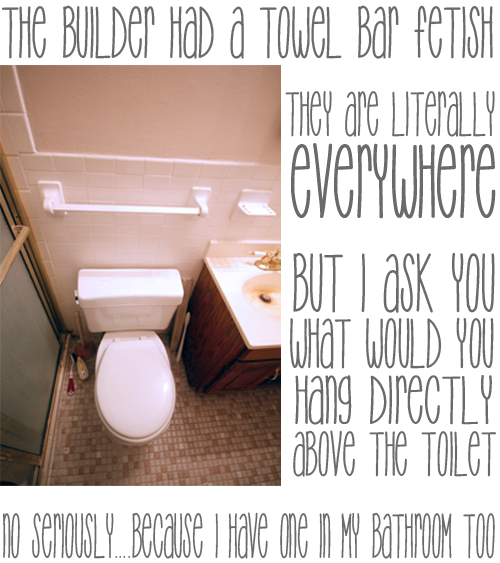 Above every toilet. In every shower. Across from the toilet and on the doors. We don’t even have enough towels to keep them all stocked. Combine them with the soap dishes and toothbrush holders of yesteryear and you have a whole lotta tile fixin. All of that tile fixin made T very angry. He channeled his inner Lou Ferrigno and busted out the whole bathroom in under three hours. Tim’s parents had stopped by to bring us an exercise bike, and they decided to get in on the fun. Thank goodness for family. Now our bathroom looks a little something like this. 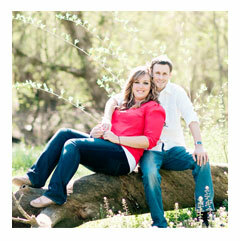 Tomorrow I will be sharing a little inspiration for the new look. 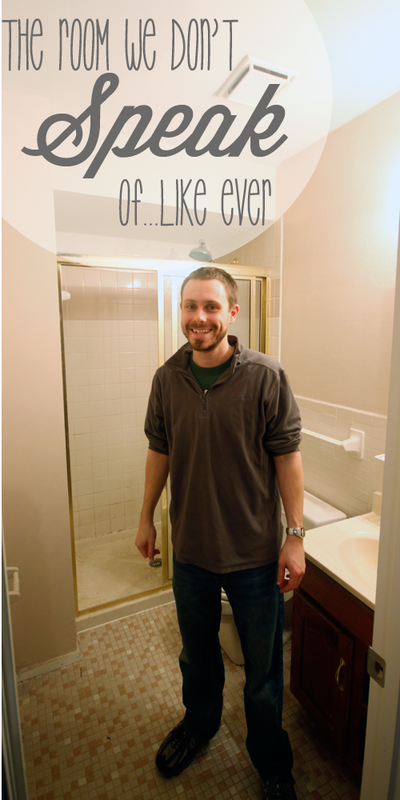 Have you ever renovated a bathroom? 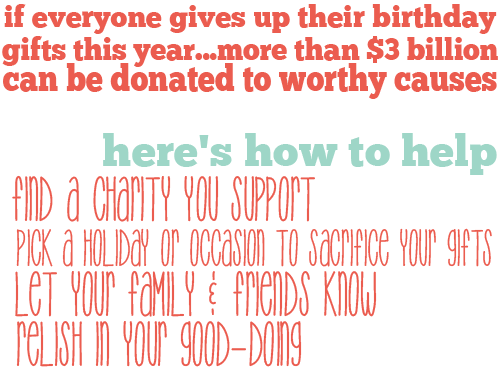 Share some tips, we are all ears.